Fitness and preventive healthcare company GOQii has made a series of launches today, unveiling two smart heath products as well as an activity tracker. The products, namely VitalECG, VitalGluco and RunGPS, are aimed at digital healthcare and well-being, and as per the company’s CEO Vishal Gondal, will help the company’s preventive healthcare efforts bridge the gap between itself and traditional healthcare devices and services. The GOQii VitalECG is designed like a standard activity tracker, and provides a single lead ECG data when a user presses a finger against the tracker’s surface. It further includes the standard activity features of the GOQii Vital, and as is GOQii’s USP, it further includes the real-life health risk management feature. This include one cardiologist consultation for buyers of the VitalECG, and upon consultation, the series of cardiac data is made available to the doctor. Additionally, there will also be a three-month health coaching package. 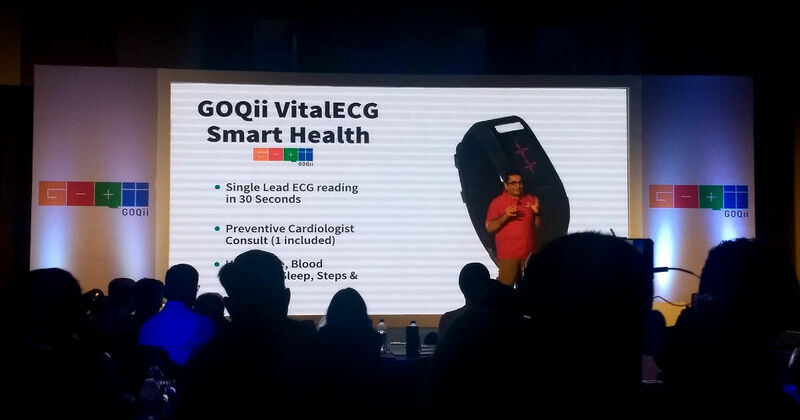 The GOQii VitalECG is priced at Rs 4,999, and is expected to launch early next year. The GOQii VitalGluco, meanwhile, is a smart glucometer that connects to any smartphone to upload data on to GOQii’s server. This data is then monitored to help an individual take preventive healthcare steps and avoid diabetes and its related issues. The device comes contracted with a diabetes coach, and has the option of setting up future doctor consultations. Upon purchase, the device will cost Rs 2,999, and come with three months of free diabetes coaching and doctor consultations. Interestingly, while the VitalGluco is a separate device for now, it may be possible that the technology is incorporated into a future version of GOQii’s health trackers, to enable non-invasive blood sugar monitoring. The GOQii RunGPS is a more conventional activity tracker, and is aimed at the community of activity and running enthusiasts. The RunGPS tracker has trackers such as heart rate, calories, sleep, distance and step counter, alongside the obvious GPS sensor embedded into the tracker. Data is provided through a smartphone app, and the tracker includes optional marathon coaching, as well as three months of health coaching. Alongside these three devices, the company has also launched a line of app updates and partnerships, all aimed at the aspects of digital well-being.